Hardly a month goes by that a new handheld stereo recorder doesn't turn up at SOS Towers, but the Rekord M has to be the dinkiest I've seen (forget palm‑sized; this could fit on two fingers!). 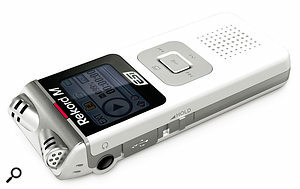 It sits somewhere between the traditional Dictaphone and the modern WAV recorder, and records at up to 16‑bit 44.1kHz. That might ring alarm bells for some, but there'd be little to be gained by increasing that to 24‑bit, given the limitations of the analogue circuitry. While it would be unfair to expect this diminutive device to put in a truly professional recording performance, I was keen to see just what it was capable of. The menu structure is well thought out, and I didn't need the manual to get up and running. Testing the device to record spoken word, and then transferring the files via USB to my DAW for critical listening, the on‑board mics captured a faithful enough recording, and the self‑noise didn't seem that bad. The handling noise, though, was less impressive: the slightest brush of a finger on the plastic surface was picked up by the on‑board mics. I also tried it on acoustic guitar, using an external mic via the mini-jack socket (a welcome inclusion) and it did a passable job of capturing the performance, with fewer noise-handling issues. I wouldn't really want to record a final take with it, but it would be handy for capturing moments of inspiration, where a typical 'smartphone' wouldn't do the job. It would be useful if ESI had thought to include a mini tripod and a corresponding threaded socket with the device, as that would reduce handling noise considerably. As it stands, this device is probably of more use to students and journalists than recordists, but its size, simplicity and good battery life make it appealing.